Snap(shot) Judgements are posts that will appear with no real regularity. It’s primarily a way for us to get thoughts and photos up as soon as possible, especially when we have no plan to write a feature-length column on the subject. 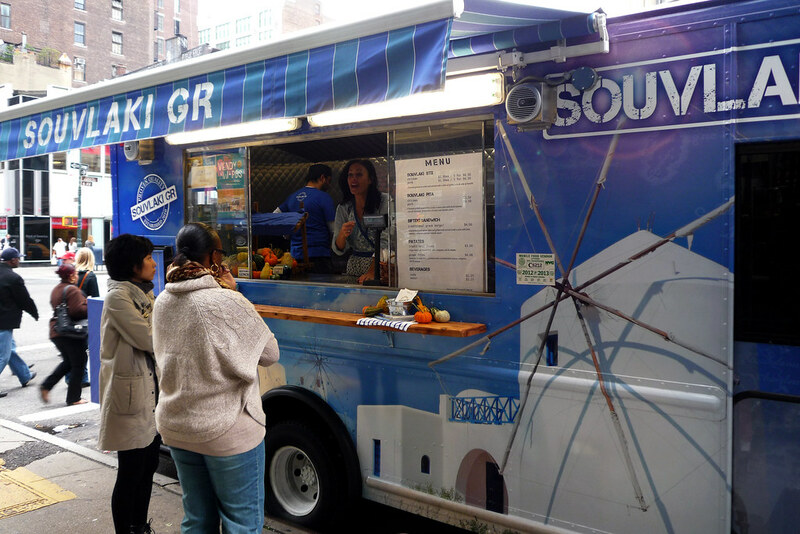 Here, Gary makes up for missing Souvlaki GR during the Vendy Awards by tracking their truck down on the streets of Manhattan. So when I covered the Vendy Awards last month, there was one glaring omission among my photos – the rookie competitors and, in particular, Souvlaki GR or Souvlaki Truck as it’s more commonly referred to. They actually won the award for best rookie and when I asked some friends what their favorites were that day on Governors Island, Souvlaki Truck was a frequent response. I actually tried finding them the next day at their Soho location but, silly me, I didn’t realize they’d be taking a break after an exhausting awards day. Weeks later, I finally found them at their Friday lunchtime Chelsea location and, man, am I glad I did. It was so good that when I found myself in Soho the next afternoon, I stopped by their truck again. Their food is awesome and well deserving of their victory.